Form 800ES is a Virginia Department of Taxation form also known as the "Insurance Premiums License Tax Estimated Tax Payment Vouchers". The latest edition of the form was released in November 1, 2017 and is available for digital filing. Download a fillable PDF version of the Form 800ES down below or find it on Virginia Department of Taxation Forms website. The Department’s website, www.tax.virginia.gov, has information to help you with your tax filing responsibilities. voucher by entering the tax information as you would if you were completing a paper form. completing a paper form and schedule your date of payment. EFT Credit: Electronically send your tax payment. See our Electronic Payment Guide for details. 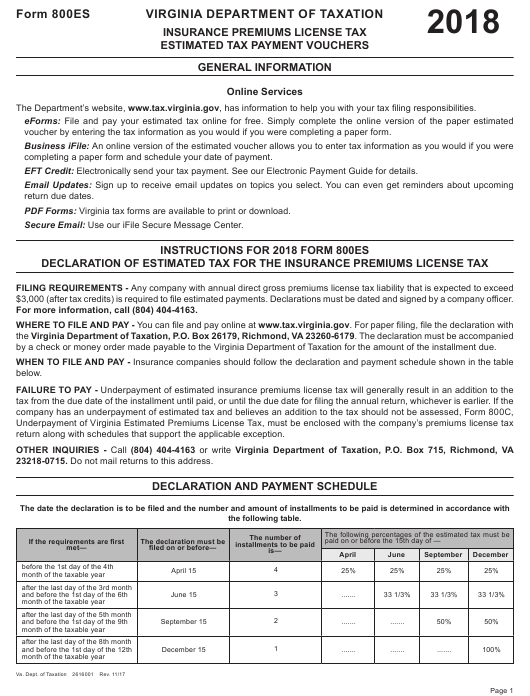 PDF Forms: Virginia tax forms are available to print or download. Secure Email: Use our iFile Secure Message Center. $3,000 (after tax credits) is required to file estimated payments. Declarations must be dated and signed by a company officer. For more information, call (804) 404-4163.
by a check or money order made payable to the Virginia Department of Taxation for the amount of the installment due. return along with schedules that support the applicable exception. 23218-0715. Do not mail returns to this address. dends to policyholders of Mutual Insurance Companies. 1. Complete the Estimated Tax Worksheet below to compute your estimated tax for 2018. April 15, 2018 enter 1/4 of Line 1A here. June 15, 2018 enter 1/3 of Line 1A here. Sept. 15, 2018 enter 1/2 of Line 1A here. 2. Enter the estimated payment amount from Line 1B (above), on Line 3 of the first voucher. 1. Enter your Virginia tax account number. 2. Enter the federal employer identification number, NAIC / license number, name, address, city, state, and ZIP Code on each voucher. 3. Enter on Line 2 of the voucher the amount shown on Line 1A of the worksheet. 4. Enter on Line 3 of the voucher the amount of your payment shown on Line 1B of the worksheet. 5. Sign the first voucher you file and detach. You need not sign SUBSEQUENT vouchers UNLESS you are amending your estimate. MONEY ORDER. Fill in the following Estimated Tax Payment Record for your own personal tax record. it. Be sure to print your Virginia tax account number on your check or money order. 1. Fill out the Amended Computation schedule below. 2. Enter the revised amounts of estimated tax and payment from Line 4 below on the NEXT voucher due. 3. File online or sign the voucher, detach, and mail with required payment on or before required due date. sure to print your Virginia tax account number on your check or money order. Please cut along dashed lines below. Order 1, 2, 3, 4. Do not submit this entire page. I declare that this declaration has been examined by me and to the best of my knowledge and belief, is true, correct, and complete.